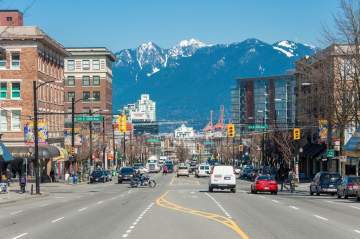 Main Street is a major north-south thoroughfare separating East Vancouver and the start of West Vancouver. It runs from Burrard Inlet in the north to Kent Avenue beside the Fraser River in the south. Main Street slopes up into the Mount Pleasant neighbourhood, and there is a mixture of commerce, light industry, brewing, and high-density residential areas. The residential/commercial mix continues, this neighbourhood was once blue-collar but is growing distinctly upscale. Once genuinely seedy, students and artists moved in about 20 years ago, followed by hipsters–who transformed South Main into the trendy neighborhood it is today–and now affluent hipsters. The intersection of Main and Hastings Street in the early days was the center of downtown Vancouver and a few blocks away was the old City Hall. Today the intersection is now a local byword for the poverty, addictions, homelessness, and prostitution often associated with the Downtown Eastside. 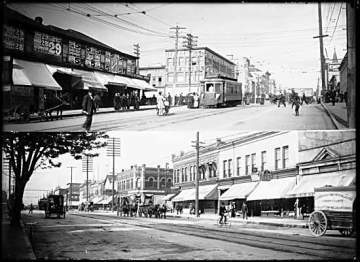 Main Street was originally named “Westminster Avenue” as it connects to New Westminster Road (now Kingsway). It received its present name in 1910. Local merchants thought that it gave a more cosmopolitan air to the neighbourhood. Main Street was previously separated into two segments by False Creek, with a drawbridge linking the two. The two areas were joined together after the eastern section of False Creek was reclaimed for railway lands in the 1910s and 1920s. 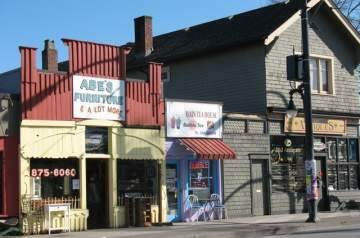 South of Broadway, there is a high density of restaurants and fashion retailing. Main Street is known locally for its hipster nightlife: craft breweries and brew pubs, relaxed bars, live music. Once known as “Antique Row”, Main Street has evolved into one of the city’s most eclectic and vibrant shopping districts. From Hastings Street to Marine Drive you can easily visit up to 25 antique and collectible stores. At the top of Main Street, Between 33rd and 41st Avenue, the street becomes more residential. South of 41st, the street enters the Sunset neighbourhood and takes on a markedly Indo-Canadian character. The Punjabi Market district begins just north of 49th Avenue; south of the Market the street again becomes predominantly residential. At Main Street’s southern intersection with Marine Drive are big-box commercial, including a Real Canadian Superstore supermarket, Canadian Tire, Marshalls and more. At the South end of Main Street, the neighbourhood is a highly-miscellaneous commercial mix including office space, manufacturing, and warehousing.